Tera Mare is rustic villa in the traditional Italian style and enjoys a reputation of being one of the best top 10 boutique villas on the Lycian Coast. İt provides a Heated pool, American Pool Table and an outside Jamie Oliver Pizza Oven and BBQ. It has charm in abundance. As you walk through a bower of foliage you discover an array of colourful suites and studios with their own unique decor built around a infinity Heated Pool. The garden is a blaze with bougainvillea, vine, orange, pomegranate and lemon trees. From its site above Kulube beach club Bay Villa Tera Mare to offers glorious views both inside and out. It’s picturesque roof terrace, has the infamous 'Ten Tola Bar' and lounge area, where families and friends gather for breakfast and is the most marvelous setting for sundowners and long dinners under the stars in the evening. Villa Terra Mare has 6 luxury bedrooms, 3 of which are en-suite master bedrooms, with breathtaking panoramic views across the sea, islands and mountains; situated 150m from the exclusive Kalamar beach. Villa provides a Jamie Oliver Pizza Oven & BBQ, with cable TV and Netflix channels. Villa also has a security alarm system and safe. Lycian Coast and Gascogne was the result of our love affair with the place and people; which we like to share with our special guests who share simillar passions in sailing, swimming, kayaking, horse riding, cycling, trekking, gastronomy, yoga and fishing. You can visit our Facebook Tera Mare Club group page as well as TeraMare web site for more photos and information. It is impossible to not too fall in love with Kalkan - the most charming fishing village on the Mediterranean, with its authenticity, restaurants and all night bars - above the mountains of Kalkan is Islamlar. Take a morning drive for breakfast or afternoon lunch or dinner and visit one of its many trout farms, vineyards, water mill, and restaurants. This part of the Lycian coast is a living museum. Enjoy your morning coffee and evening sundowners at your private roof terrace Ten Tola Bar. The property provides a natural swimming pool, uninterrupted views of Kalamar Bay and Islands, and is within 3 minute walk to the beach. For would be chefs, try out the wood fired stone oven and BBQ - ideal for Paella, meditteranean roasts. Benefits to Kalkan are too numerous to mention, please visit our TeraMare web site and Facebook group to see more photos or simply contact us. En-suite bathroom to annex studio, shower washbasin, wc. En-suite bathroom to master bedroom 2 with bath, shower washbasin, wc. En-suite bathroom to master bedroom 3 with shower, washbasin, wc. Bathroom with shower, wc, washbasin. WC, washbasin. Patio French windows open out to swimming pool, open fire-place, A/C unit, DVD player, Satellite TV, and Bose Speaker for iPods. Fully equipped İtalian kitchen, with wine cabinet, dishwasher, toaster, panini toaster, oven, hob, fridge/freezer, juice maker, blender, dining facilities. We have just returned from a lovely two family holiday in this beautiful homely villa. The location of the villa was perfect in the quiet village of Kalamar with the beach club at the bottom of the road and plenty of restaurants within a five minute walk. We also walked the twenty minutes into Kalkan daily which had lots of lovely little shops and a huge selection of restaurants. The whole area was beautiful and gave us a lovely first impression of Turkey. The villa itself was beautifully presented and immaculate. We were two families (4 adults and 4 children) and had lots of space to enjoy both company or peace and quiet. The area around the pool is quite small and doesn't get too much sun at this time of year but the fact that there are so many balconies and a huge rooftop area with a stunning view meant that this was not a problem! In fact it was a good excuse to make use of the rooftop bar! Our pool and pool area was maintained regularly throughout our stay and our host was available to answer any questions we had. We thoroughly enjoyed our first time to the area and found there was plenty to keep the children occupied without going far from the village. We will definitely be back! Villa Tera Mare was one of the first villas I looked at for our family holiday this year. We're a big family (11) and needed a big villa but not just any big villa, one that was filled with energy just like us. I fell in love with Tera Mare and couldn't chose another. I must say it didn't disappoint, everyone from the 62yr old to the 5yr old were impressed. Mustafa was a pleasure to work with and the site manager Derman was wonderful. If you're looking for a villa with style Tera Mare is the one, on our first morning Derman arrived with all of the information you will need for your entire stay, taxi numbers, restaurant recommendations, water delivery number etc and a pre credit phone to make calls. Villa Tera Mare is in a hillside town so expect hills but the views from the rooftop are breathtaking. The villa is clean and there is enough space to enjoy time together and time apart. Kalkan is a special place as is Villa Tera Mare. My family and I had a great stay at Villa Terra Mare. It is located Kalamar Bay side of Kalkan so is a short taxi drive away from the main town and costs 20lira. The roof top bar has great views across the bay and we made use of watching the sunset here in the evening. Every bedroom was large and spacious and there were lots of different areas to the villa which meant you could also get some alone time if you wanted. The one point I would say let the villa down slightly was the fact there wasn’t a lot of space around the pool and the sun didn’t hit the sun beds until midday - but not a big deal breaker! Mustafa was a great host, he was contactable all the time and was always very helpful and friendly. I would definitely recommend this villa!!! We decided to book Villa Tera Mare due to its large size (group of 10) & quirky features. Upon arrival the villa did not disappoint with a fantastic open plan kitchen/living space, plenty of outdoor seating & a good sized swimming pool. A few more sun-beds around the pool would have been nice but it didn't stop us making full use of the outside areas. The stand out feature has to be the rooftop bar which provides stunning views of the bay & is the perfect setting for evening drinks! Kalkan itself is a beautiful place with lots of restaurants & bars. Some are within walking distance along with a small supermarket (prepare for lots of hills though!) but a taxi to the centre is roughly 15TL so we headed there most nights for the extra variety. We'd definitely recommend staying at Villa Tera Mare. It's perfect for large groups & the quirky decor & features of the property add that little bit extra to your holiday experience! Wow, awesome, what a view! What a beautiful space. It was clean, tidy and had been stylishly and tastefully appointed. We will definitely be coming back and would recommend to anyone. The weather, sea and food were amazing but the people were even better!!! Beautiful venue, rooftop bar was amazing. 5 minute walk to local shop who will deliver with no problem. Always need a taxi into the centre of town but prices are reasonable and service is quick. Scuba diving school is available to guests at Kalamar Bay. Courses offer internationally recognised certification catering for all standards. For inexperienced and beginners, lessons are carried out in the calm waters of Kalkan Bay. For the more experienced, boat trips to nearby dive sites for wall, reef, cave, night, deep stream, antique amphora, ship wreck dives. The coast around Kalkan has some of the best wrecks and marine life in the world (including endangered Loggerhead and Green Turtles as their breeding ground is nearby). The sea water quality is superb having been awarded Blue Flag status. Dolphins can also be spotted in the bay. We can also organize 1, 2 & 3 day luxury Gullet Cruise dive excursions exploring local islands, secluded sea caves, coves and beaches. Kalamar bay beach is 150m away. There are a few bars and restaurants within 5 minutes walk, as is the Kalamar Beach Club, which offers restaurant, water sports, diving and free courtesy transport. The property is well placed for visiting many historical sites Stunning Patara Beach 20 mins by car/dolmus, with 18km of golden sand, is protected as turtles lay eggs here. 'The loveliest beach in Turkey, if not the Mediterranean' The Daily Telegraph. Dalaman is the closest airport. There are direct flights from the UK or via Istanbul. Transfers from Dalaman by Luxury air conditioned 5 or 7-seater Mercedes takes approx 75 mins and can be arranged for you on request.Car Hire can be arranged if required from Dalaman Airport or Kalkan. Mini buses are an inexpensive way of exploring the region and operate between Kalkan and local beaches, towns and places of interest. There is a helicopter service available on request. A 15-20 minute walk will take you Kalkan Marina. A 15-20 minutes drive will take you to Patara beach - voted one of the world's best beaches in the Sunday Times, Xantos, Sakli Kent Gorge, or to the traditional mountain village of Islamlar with its natural trout farms, fresh water from the Trodos mountains, vineyards, watermill where you can experience a natural village life while enjoying its many restaurants. Taxis are available. This part of the Lycian Peninsula is a living museum. 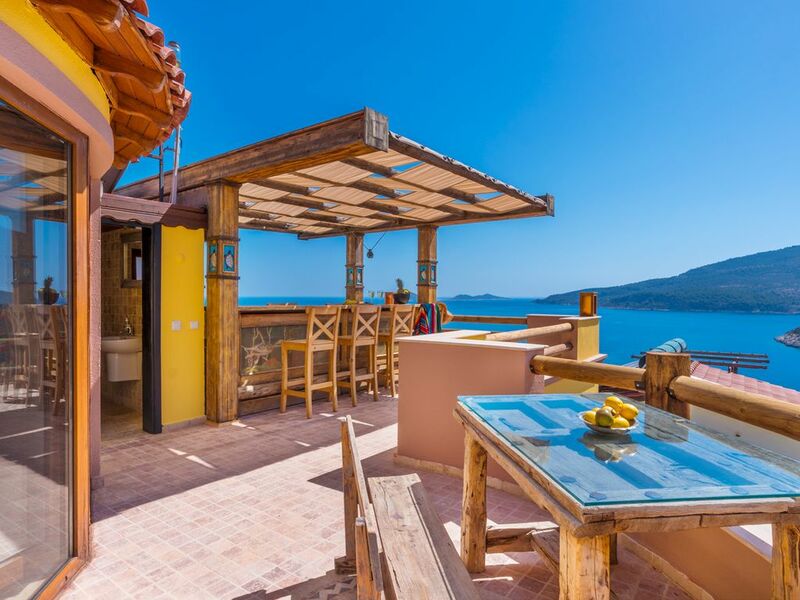 Kalkan has a vast choice of rooftop and waterfront restaurants and bars which give stunning views of the sunset over the bay and night time moon and stars. Kalkan perhaps offers the most stylish ambiance. Food is a fusion of regional Turkish, and Mediterranean cuisine at its best. Beer is cold and from the tap; the cocktails mildly potent. Due to strict building regulations and the efforts of the Kalkan Foundation, the town has retained its charm and special ambiance. A Sunday Times article likened visitors to Kalkan to those attracted to Tuscany and the Dordogne. Kalkan certainly beckons the discerning holiday maker. Kalkan has a range of larger supermarkets, a daily fresh fish and veg market, shops, street market on Thursdays, several banks with ATM, hospital, local English speaking doctor & pharmacies. There is a mini market within 5 minutes walk from the Villa offering free delivery. There is an abundance of ancient historical sites within easy reach of Kalkan. Xanthos, Patara and Myra, the home of St. Nicholas, being just a few. Take a Gullet boat trip to the sunken city of Kekova. The gorge at Saklikent provides another area for walking and river rafting. You can take a jeep safari up the mountains. A para-gliding centre is also nearby. Our English Service Manager in Kalkan can arrange excursions, walking tours, Gullet boat trips, Yacht hire, etc. Charter flights are the cheapest way to Turkey. Direct flights to Dalaman are available from almost every airport in the UK, some taking under 4 hours. For airport transfers, we have an arrangement with a Kalkan travel firm offering the best prices and a reliable service for our guests from Dalaman and car hire if required. Booking Notes: 25% non-refundable deposit is required to secure a booking, with the full balance due 10 weeks before departure. We also require a £300 deposit for breakages/damages, other than normal wear and tear, and this will be returned within two weeks after your departure. Changeover Day: Changeover days are flexible, and happy to accomodate your travel arrangements. Notes on prices: Pool is Heated Early/Late Season, beginning from 2014. There is a £75 supplement per week.